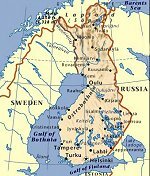 Over the centuries Finland was ruled by both Swedish and Russian factions, and then, in 1917, it declared itself an independent republic and has been independent ever since. It's truly a country of lakes, with over 60,000 found within its border, and those lakes, as well as the surrounding waters help moderate its climate. Finnish movie posters come in these dominant sizes. 23x33 - this is the standard size, similar to Germany but recently the size has changed to 27x39. Reproductions are not common but, because of the rising popularity, I expect to see some soon. Can't find the poster you want for sale?